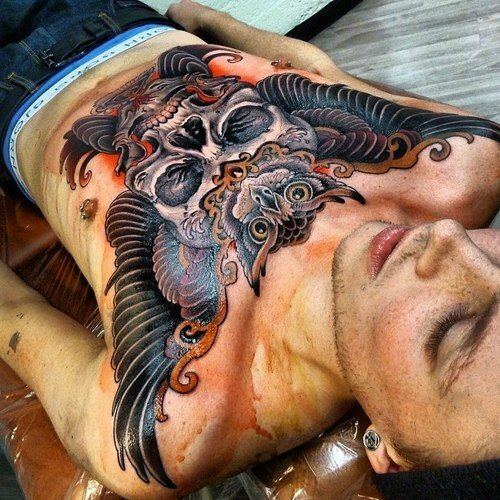 Nowadays, skull tattoos for men are probably one of the most popular subjects when it comes to tattooing. If you live in a big city, there is a high possibility that you already saw someone with a painting like that on his body. Because of their extreme popularity, these tats are getting more and more overused, and it’s quite hard to find the ones which look truly great. 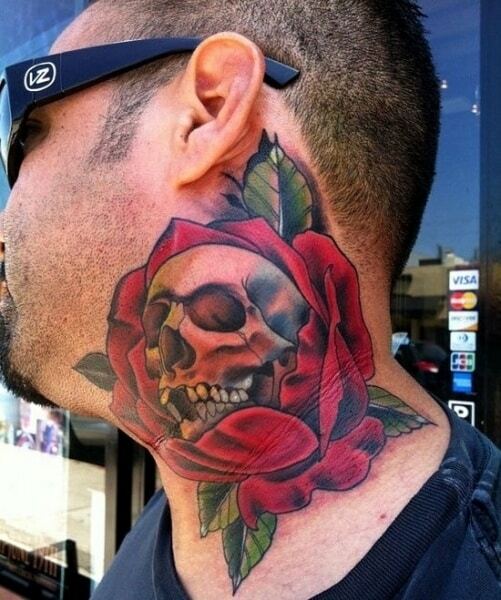 A lot of people just want one on their body, so they go to the first parlor they see, and request the most basic skull. If you think about this, it’s not a big surprise that there aren’t many cool skull tattoos for guys, but it’s still quite saddening. Especially if you know the fact that the more talented tattooists can make very unique drawings. If you want a truly amazing painting on your body, you should really take your time and look carefully for parlors where they can make the tattoo of your dreams. 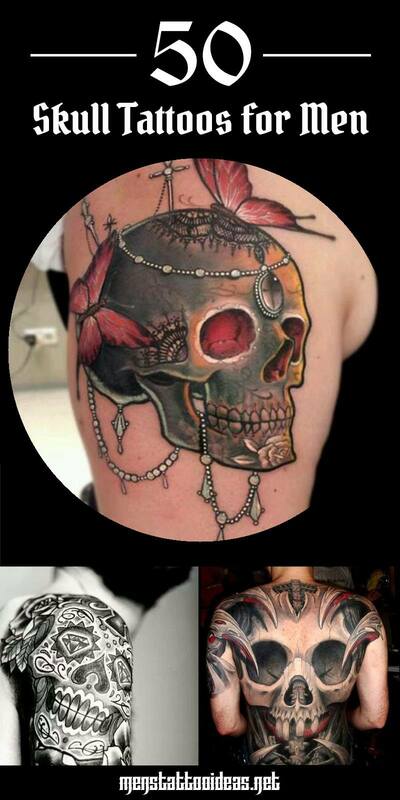 But which skull tattoo is the most ideal for you? Well that’s entirely up to you, but take into account that someone can draw your ideal skull tattoo much better. It will probably cost more, but it’s worth the extra money, since you will wear it for the rest of your life. Which Skull tattoo shall I get? Just like every other tattoo, these can come in various forms and sizes, depending on the person’s style. One of the best things about them is that they can be mixed with a lot of other subjects, like wings, hats, flames, and sunglasses. Of course it’s better if you don’t exaggerate things, since if you put a lot of different things on the skull, it can look pretty bad. 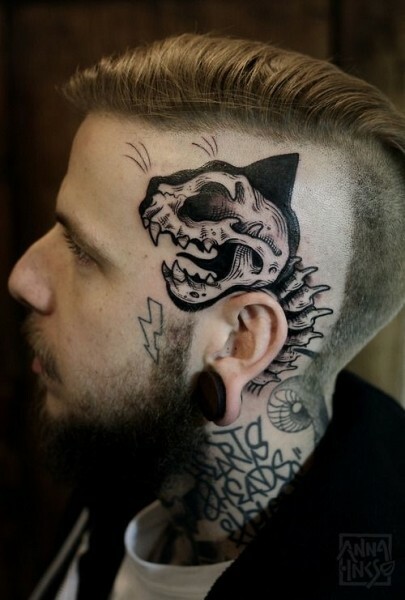 A cat’s skull tattoo rests on the side of the head right on top of the human ear, with the animal’s pointed ear inked as a silhouette in the backdrop.The cat’s spine traverses down the back outlining the ear’s contour, going further down the neck to fade into stylish letterings. 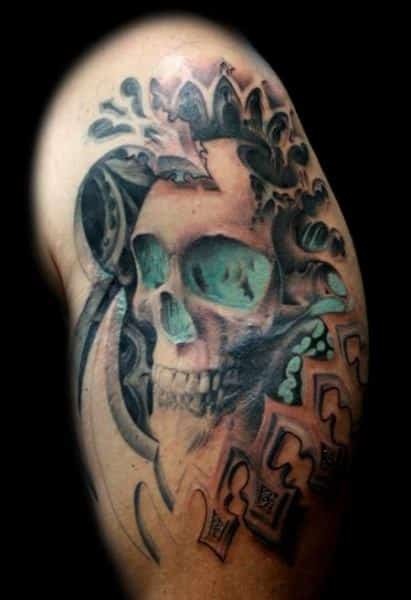 One of the skull tattoos for men possessing remarkable beauty. Butterflies flutter above a female skull, where exquisite head jewelry dresses the frontal lobe and the beads extend across to be entwined around it and dangle gracefully at the bottom. 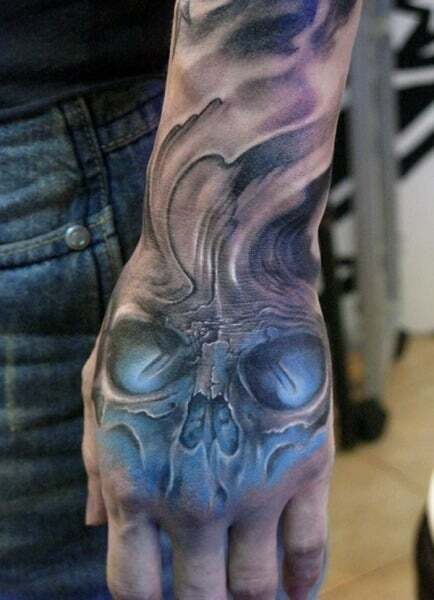 This top hand arm skull image seems to flow from light and darkness represented by curves that trace the arm to eventually end down the knuckles. The entire hollow face of the skull is glowing in a blazing blue color. 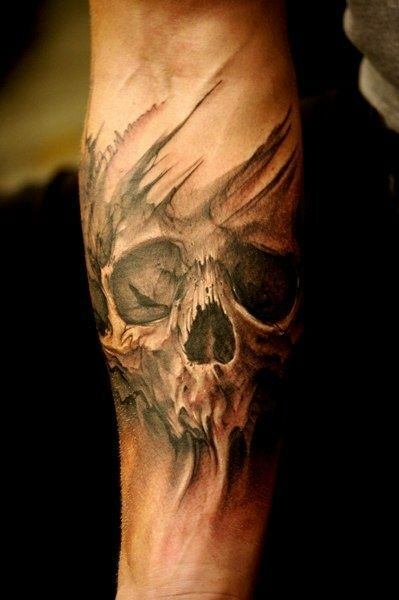 This forearm tattoo highlights a ghastly yet strikingly beautiful face of a skull. It seems to have a life of its own with long black veins above and below the intricate drawing this delicately inked picture is made up of. Arguably one of the best skull tattoos for guys, this stellar image features a respectable skull wearing a crown, only to reveal the face of a night owl with heavily feathered wings widespread across the entire chest to display its vibrant colors! 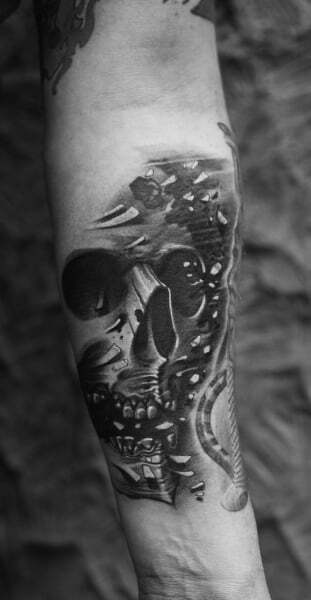 An upper arm tattoo of a skull that shows great depths as it opens up and allows you to take a peek of what’s lurking within. The face shows bare teeth and keeps a light green tone of the eyes and nose to break the surrounding darkness. Contemporary design defines this black and white drawing of a skull with wide eyes, once perfect nose, and open mouth. It shows movement and action with the wind blowing off tiny bones and various particles carried away to the blackness of nowhere. 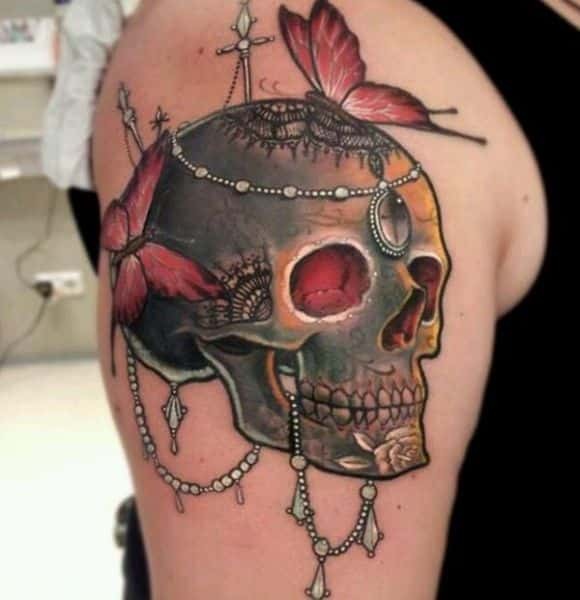 Covering the entire arm, tracing the sides of the body and chest, this skull tattoo design offers uniqueness in every aspect. A mischievous-looking skull still holds an eyeball on its left hollow spot. Modern items are etched such as a light bulb and television, made to blend with nature’s elements. 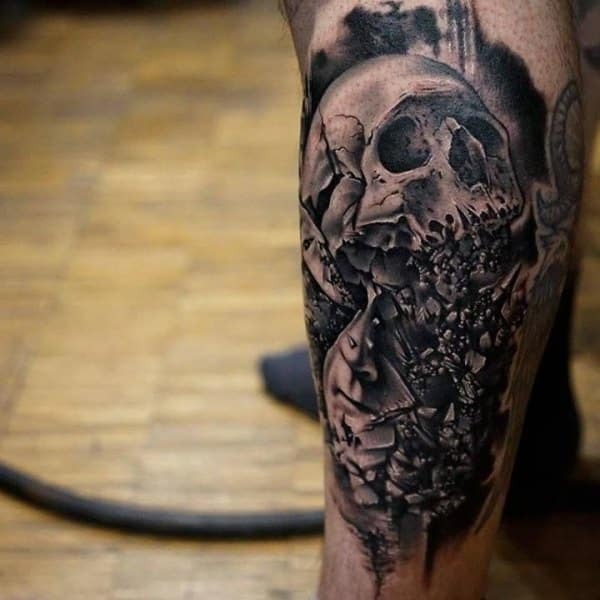 A skull that holds so much more meaning with each detailed ink it was tattooed with on the human leg. The rounded form appears well from the head to the eyes and hollow nose, but breaks apart at the back of the head crumbling from the mouth to the jawline. A huge red rose goes in full bloom, with its big petals softly cradling a fragile skull. It appears delicately cared for and loved with the radiating vibrance of the flower and growth of rich green leaves sprouting around it right on the side of the neck.